PARALLEL CARDS: Refractor #/499, Blue Refractor #/199, Black Refractor #/100, Sepia Refractor #/75, Gold Refractor #/50, Red Refractor #/25, Atomic Refractor #/10, Super-Fractor 1/1, Printing Plates 1/1. Get full details and images of all 32 cards here. Featuring 50 players. 1:24 Packs. Click here for a complete gallery and guide. 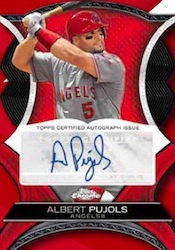 Over the years, Topps Chrome has become one of the hobby's most dependable brands. Relying on a nice mix of shiny base cards, colorful refractors and autographed rookie cards, the lineup caters to a broad mix of collectors. 2012 Topps Chrome Baseball sticks largely with what's familiar and steps it up with a few new wrinkles. Of the new content, die-cut designs lead the way. The Dynamic Die Cut checklist has 50 cards. Inserted just one per hobby box, individual singles are a tough find. The die-cut theme continues with Cut From the Same Cloth, double-sided dual autographs. Of course, 2012 Topps Chrome Baseball still boasts the plentiful Refractors, which come in nine different designs. Every third hobby case has a Refractor hot box. At least 25 rookies have autographed variations, which also come with Refractor rainbows. 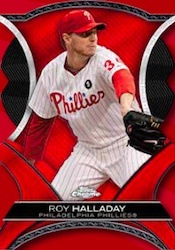 2012 Topps Chrome Baseball comes with a 220-card base set that blends veterans and rookies. Refractor parallels: Refractors (1:3), X-Fractors (1:6), Blue Refractors (#/199), Black Refractors (#/100), Sepia Refractors (#/75), Gold Refractors (#/50), Red Refractors (#/25), Atomic Refractors (#/10), Printing Plates, Super-Fractors (1/1). Base set has Autographed Patch Variations. Available only in hobby packs, the cards are limited to 10 numbered copies. Autographed Rookie Card Variations are available for 32 players and feature on-card signatures. Inserted two per box, collectors can hunt for the likes of Bryce Harper, Yu Darvish, Jesus Montero and Matt Moore. Autographed Rookie Card parallels: Refractors (#/499), Blue Refractors (#/199), Black Refractors (#/100), Sepia Refractors (#/75), Gold Refractors (#/50), Red Refractors (#/25), Atomic Refractors (#/10), Printing Plates, Super-Fractors (1/1). 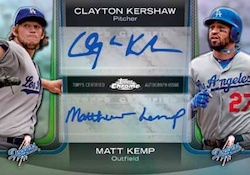 Dual Autographs (ten cards, #/10) are new to the Topps Chrome brand. Autographs Chrome Buybacks (ten cards, #/10) feature players who didn't have a signed Topps Chrome rookie. Numbered to 10, Chrome Encounters Autographs focus on big-name stars like Justin Verlander, Chipper Jones and Adrian Gonzalez. Just as the name suggests, Dynamic Die Cut cards feature interesting shapes on Refractor stock. With 50 cards in the set and falling just one per box, expect to pay a premium as player collectors and set builders clamor for singles. Parallel: Autographs (#/25 or less). Cut From the Same Cloth are double-sided die-cut autographs. Exclusive to hobby packs, the cards are numbered to 5. Pairings include Jose Bautista/Brett Lawrie and Buster Posey/Joe Mauer. Every third hobby case comes with a Refractor Hot Box where every card is a Refractor. Random hobby packs have redemptions for uncut sheets. Good: Great combination of current veterans and rookies, base design is clean and solid, different varieties of autographs which are die cut, rookie and buyback autographs are on-card, base set variations make another appearance. 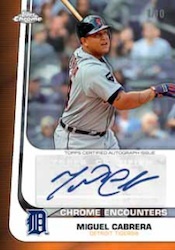 Bad: It's challenging and costly to complete every aspect of the base and insert sets, many autographs use stickers, finger prints show easily, no past players or Hall of Famers, like other recent Topps Chrome sets, cards are prone to warping. The Bottom Line: 2012 Topps Chrome Baseball is a mid-end product that many collectors will be interested in given its appearance, cost, and brand name. With 24 packs of just four cards per pack, you may not get many cards, but the chance of pulling a big-time autograph should keep collectors coming. 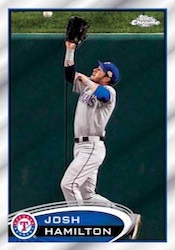 The base card design looks the same as the last several Topps Chrome products: shiny with a clean, solid look. This is not a bad thing, but it would be nice to see some sort of change. Hopefully Topps has something on the table for next year's release. It is nice to see base set variations as it adds more of a challenge to put together a master base set. Refractor parallels are extremely sharp. I love the Dynamic Die Cuts. They are very colorful and attractive. It's too bad they fall just one per box. The good news is that rookie autographs are signed directly on the card. Unfortunately, the same can not be said for the other autograph sets in this product. 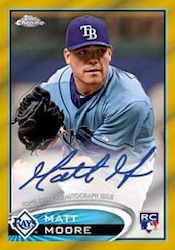 Topps should try to go the route of more on-card autographs than using stickers for the brand. 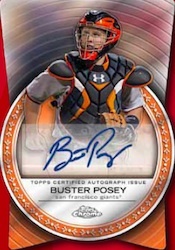 The 2012 Topps Chrome Baseball checklist has 220 cards. The best veteran players are included as well as the major rookies like Bryce Harper and Yu Darvish. Returning again are base variation cards, this time with 20 players. This product is ideal for collectors who like rookies and rainbow parallels. There are many different autograph inserts but no base relic sets. Other than the Rookie Reprint Autographs, there are no other past players or Hall of Famers included in this product. Hopefully Topps can include them in future releases. At about $75 per box, the price is very reasonable based on what is included in the product and what you can potentially pull. It is worth the risk in order to pull some of the major hits, which are highlighted by autographs of Mike Trout, Bryce Harper, Yu Darvish, Albert Pujols and Ken Griffey Jr. There are many more All-Star and top prospect autographs in this product. The base variations are good for a little added value as well. Although it may not have a lot of cards per pack, 2012 Topps Chrome Baseball is still a fun box to break. The hits are the biggest selling point. There is not a lot of variety when it comes to the inserts, other than colored Refractor parallels and the one die-cut insert. Either way, collectors should have a blast busting this box open. Not a fan of the shiny stuff, but as always it has a solid rookie auto checklist. I can do without the die-cut inserts, but I love the Chrome Encounters design. I’ve bought two boxes of this product and the best card I got is a Anibal Sanchez sepia refractory. I’ve got more doubles per box than any other this year. Chrome is usually a nice product but this year Topps really screwed it up. The third Pack I got of a chrome I got a sepia refractor and I also got a Tyler Pastorknicky. I absolutely love the chrome cards. This is probably my favorite of all the Topps cards. I can’t buy as many because of the higher price, but the quality is unbeatable! Topps Chrome has always been my favorite product. In 2011, I got a box of Chrome and pulled a Mark Trumbo auto in my first pack, and since then I’ve been hooked. I’ve bought 2 boxes of 2012 Chrome and about 15 packs. In that, I pulled a Darvish base auto, a Montero auto, a Darvish blue auto /199, and a Jordan Pacheco atomic auto /10, so I’d definently give this product 5 stars. I hope Topps continues this product for a long time, and I’m sure I’ll still be buying every year to come. These are very cool cards. True, every smudge and fingerprint shows, so before I put them away I wipe them off carefully. The better care I take, the better return down the road. I really like the diecuts and the different color refractors. The last time I broke open a pack, I got a Bryce Harper orange refractor. Way cool, dude.